Dr Karl Kruszelnicki AM (pictured with his usual bright shirt 🙂 ) used to be a “proper pukka scientist, engineer and doctor”, but is currently an author and science educator on radio, television and through the many books he has written. He is the Julius Sumner Miller Fellow at the University of Sydney, in the Science Foundation of the Physics Department. 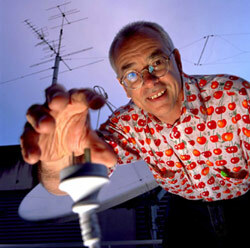 This Podcast is an edited package of Dr Karl’s magical hour of science Q&A every Thursday morning on the Australian Broadcasting Corporation (ABC) youth radio network Triple j. It’s roughly an hour devoted to the collective exploration of some of the great mysteries of life, such as “why is belly button fluff blue?”. Guerilla TV maker, John Safran lisped his way to notoriety in 1997’s Race Around the World, placing curses on ex-girlfriends and breaking into Disneyland. Soon after he got himself throttled by Ray Martin in John Safran: Media Tycoon. A few years later he hassled rock stars and music moles in John Safran’s Music Jamboree. Then went to hell and back in John Safran vs God, even getting a real life exorcism! On the podcast John Safran and his guests (including regular Father Bob who co-hosted the SBS TV Show Speaking In Tongues with John) talk an amusing mix of religion and politics. Background Briefing is ABC Radio National’s agenda-setting current affairs radio documentary program. It varies from week to week in style and content, sometimes doing straight investigative journalism, sometimes exploring important ideas or social issues in on-the-road documentary style. You will find profiles of politicians, analysis of behind-the-scenes issues that shape society, and sometimes an exploration of an idea – or perhaps a murder. Previous shows have covered topics like Selling China: The Wal-Mart Effect, Googlemania, the Elusive Exclusive Brethren and Lula: Brazil’s Worker President. Future Tense is essential listening for those interested in exploring the social, cultural, political and economic fault lines arising from rapid change. The weekly half-hour program/podcast takes a critical look at new technologies, new approaches and new ways of thinking. From politics to media to environmental sustainability, nothing is outside its brief. Future Tense explores the issues and provides critical analysis, offering an insight into how our world is changing and how we in turn are learning to adapt. ABC Science Online’s astronomy, space sciences and cosmology expert Stuart Gary tells us the latest discoveries across the universe and space science news from around the world. Nightlife with Tony Delroy is a diverse mix of news and current affairs, lifestyle and entertainment broadcast on ABC Local Radio stations around Australia from 10pm – 2am Mon-Fri EST. The podcast only contains the first 45min segment where topics like Money matters, science and technology, spiritual questions, human and family issues are discussed with experts, and listeners are given many opportunities for interaction and talkback. Regular expert guests include Motoring guru Will Hagon, John Nalley from My Sky and Space magazine, finance advisor Paul Clitheroe and Gadget expert Peter Blasina amongst many others. What can listeners expects from the programme? Primarily an assumption that the audience is interested in technology, even if it is not directly accessible. Digital Planet will aim to introduce new technological concepts and be less worried that the audience might not be familiar with them … look at stuff most of us will never own such as hugely expensive pieces of kit, the digital equivalent of, say, unaffordable cars … but it will also continue to evaluate the latest technological developments and set them within a global context. However the programme will not be a geekfest. It will retain a strong practical component, the core being how technology is affecting our lives worldwide. PS I personally use and recommend the FREE Juice Cross platform (Windows, Apple Mac and Linux) podcast subscription software. I am new reader of this blog. Firstly i want to tell you Happy New Year. Yep i am very fond of BBC world i am used to listen it. Thanks for the information dude.